Get it fast and make it delicious with a hot air popcorn popper. You don’t need cooking oil to pop up a batch of fluffy, white popcorn when you use a hot air popcorn popper. Melt a little butter in the top of the machine if you wish, but this is optional if you would rather keep your popcorn low in fat and calories. With a hot air popper, you can make tasty popcorn quickly and simply. Place the hot air popper onto the counter and remove the cover from the base. Use the butter-melting cup (which doubles as a measuring cup) to measure 1/2-cup of popcorn. Pour the popcorn into the base of the unit. Place the cover onto the base and put the butter-melting cup into the top of the cover. Place as much as 3 tbsp. of butter or margarine into the butter-melting cup. Position the bowl beneath the chute of the cover to catch the popped popcorn as it flows out of the base. 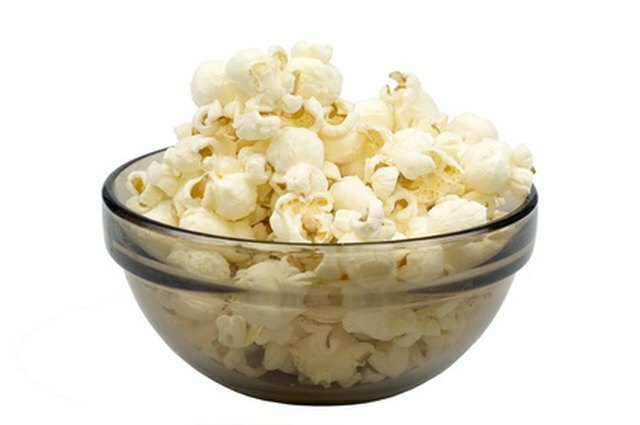 Plug the hot air popper in and allow it to operate to warm the popcorn kernels in the base. As the popcorn pops, the butter or margarine in the butter-melting cup will melt. Unplug the popcorn popper after the popcorn finishes popping -- approximately three minutes. Pour the melted butter or margarine over the popped popcorn. Add salt to the popcorn, if you desire. 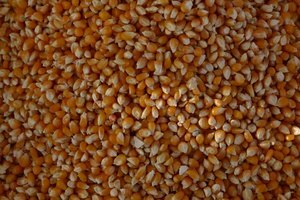 Discard any unpopped kernels from the bottom of the base. Allow the popcorn popper to cool after you finish popping the popcorn. Wash the cover and the butter-melting cup by hand with dishwashing detergent. Rinse these pieces well with warm water. If the popcorn popper shuts off unexpectedly, unplug the unit. Allow the popper to cool down for about 15 minutes and then plug it in again after the motor cools sufficiently. Never operate the hot air popcorn popper without the cover and the butter-melting cup in place. Popcorn may shoot everywhere without the cover and cup in place. Never immerse the base of the popcorn popper in water. Do not wash the cover and butter-melting cup in the dishwasher. 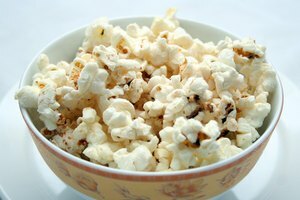 What Is the Healthiest Way to Cook Popcorn?